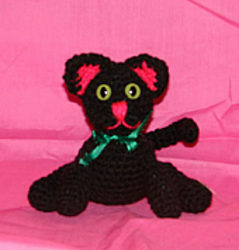 This sporty kitten free crochet amigurumi pattern is good luck for all you black cat lovers! Try this free easy crochet pattern and give a gift to your favorite niece! Note: Do not join rounds unless otherwise indicated. Mark beginning of each round with a stitch marker or scrap of yarn. Rnds 6 - 8: Sc in each sc around. Rnd 10: Sc in each sc around. Attach eyes centered over rnds 5 - 6 of face having 2 sc between eyes. Rnds 14 - 19: Sc in each sc around. Rnd 21: Sc in each sc around. Add more stuffing to body and sew opening closed. Weave in loose ends. Rnds 7 - 9: Sc in each sc around. Rnd 10: Sc in each sc around, join in next sc, fasten off. Stuff legs and sew opening at rnd 10 closed and sew legs to sides of lower body in a sitting position. Rnds 3 - 8: Sc in each sc around. Rnd 9: Sc in each sc around, join in next sc, fasten off. Stuff arms and sew opening at rnd 9 close. Sew arms to sides of body over rnds 12 - 15 to align with legs. Row 3: Sc in each sc across, ch 1, turn. Row 4: Sc in each sc across, ch 1, DO NOT TURN. Edging: Work 3 sc evenly down side of ear, work 3 sc in starting ch of top point, work 3 sc evenly up side to row 4, sl st in forst sc of row 4, fasten off. Work rows 1 - 3 of back of ears using pink yarn instead of MC yarn. Row 4: Sc in each sc across, changing to MC yarn in last step of last sc, break off pink, ch 1, DO NOT TURN. Edging: Repeat as for back of ear. With a length of MC yarn, sew one front and one back ear section together to form one ear. Sew ears to top of head over rnds 1 - 5. Rnd 4: Sc in each sc around, join in next sc. Leaving a length of yarn for sewing, fasten off. Sew muzzle to center of face under eyes. With a length of pink yarn, embroider nose and mouth onto muzzle. Note: Row counting is not important for tail. Continue working rnds of sc in each sc around until tail measures 5 inches long or desired length. Do not stuff tail. Fold pipe cleaner in half and insert into tail leaving about a half an inch of the pipe cleaner sticking out. Place tail in center of back at bottom of body, insert the visible pipe cleaner into the body for extra support. Sew tail into place. Curve tail into shape. Tie ribbon into a bow around neck if desired.